Pakistan has expressed full support for any move of the Organisation of Islamic Cooperation (OIC) to highlight the plight of the Palestinians, besides deploring the UN Security Council failure to slam brutalities of Israeli forces along Gaza border. 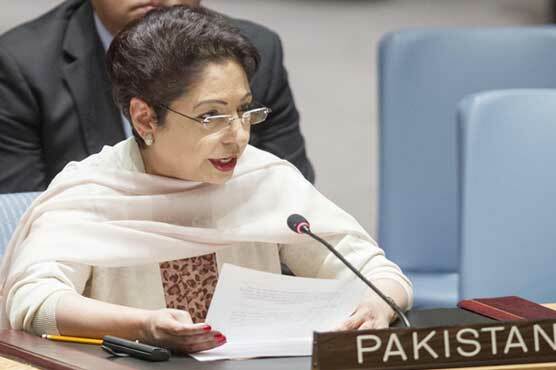 Referring to the USA move, Pakistan's permanent representative at the UN Maleeha Lodhi deplored that a country has again vetoed the unanimous call of the other 14 UNSC members to investigate the killing at least 61 Palestinians along the by Israeli forces. She said the U.S. action to shift its Embassy from Tel Aviv to Jerusalem is not only an egregious violation of global law and contravention of the UN Charter's prohibition of the forcible acquisition of territory, they also gravely undermine any prospect of a two-state solution in the Middle East. It had further been reported that Pakistan will observe "Palestine Solidarity Day" on May 18. Earlier, PM Shahid Khaqan Abbasi directed the day to be observed across the country. They also gravely undermined any prospect of a two-state solution in the Middle East. The government and the people of Pakistan would continue supporting their Palestinian brethren and presenting their case at every forum, the statement said quoting the Prime Minister. The day is aimed to demonstrate complete solidarity with the Palestinians in wake of Israeli troops killing dozens of Palestinians during clashes and protests along the Gaza border against the USA embassy opening in Jerusalem on Monday - the conflict's bloodiest day in years. At least 61 people have been killed by the Israeli military and more than 2,700 injured along the Gaza border on Monday, health officials said, as the United States officially moves its embassy from Tel Aviv to Jerusalem.